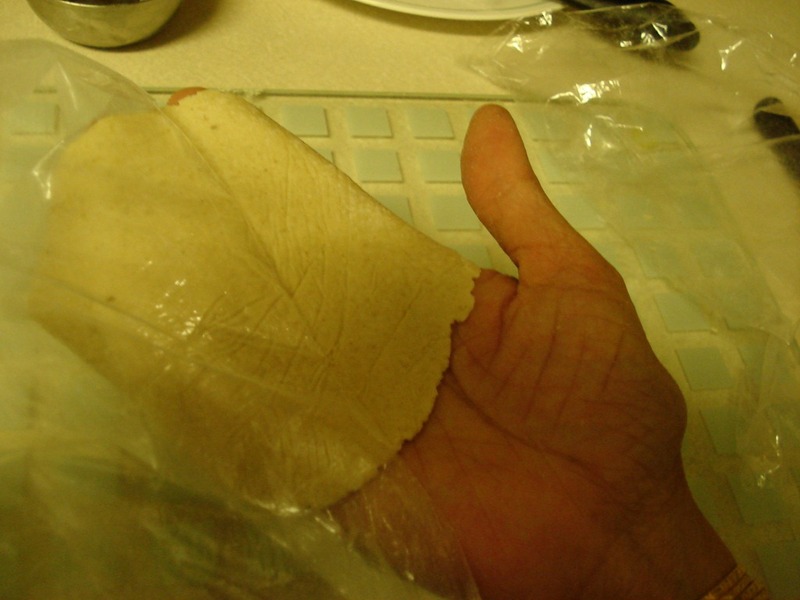 The Gluten Free “Miracle” Chapati / Tortilla | Can't Believe It's Allergy Free! on October 5, 2012 at 9:10 pm | Reply Start Here « Can't Believe It's Allergy Free! Thank you so much for the recipe and the tips! This flour blend is quite different from the one you show on the “Show me the curry” website. Which one would be better? Are rajgira and quinoa similar? I find both quite expensive. Could you please suggest substitutions? I have jowar, bajra, ragi, buckwheat, white rice and brown rice flours. Would you know if teff is similar to ragi or bajra? Good to know that guar gum is from gavar. I was staying away from it. What is the “gund” we use to make laddoos? Thankyou, Ratna! The flour blend on my blog is even better than the one I show on SMTC, because I keep experimenting and stumble upon better ways of doing things as I go along. Very soon, I will be adding a variation which results in really soft chapatis which maintain texture for a day or two and freeze very well, so be on the look out! I have explained rajgira and quinoa in my note. You will find that each one has essential nutrients in different proportions, and together they create balance. You could try buying them in stores which stock bulk quantities in bins. That works out cheaper than buying packaged stuff. You already have jowar (sorghum). Bajra, which I have tried, gives a rough texture. Ragi gives a very dark color, which doesn’t appeal to some. But add half a cup to the mixture and let me know if smell and texture remain good. Teff is closer to rajgira than to other grains. It is protein rich, and is significantly richer in calcium, potassium and iron than other grains. I have not tried it, but I will and tell you when I do. 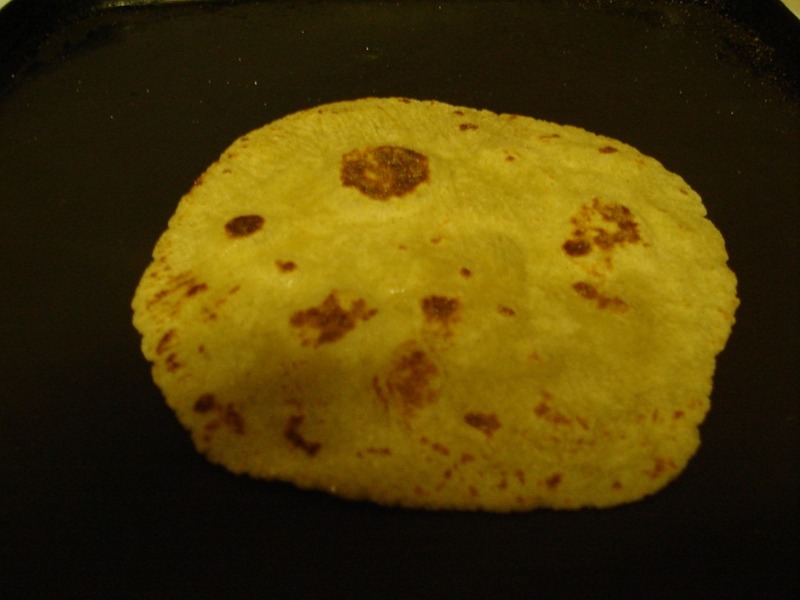 chapatis can be rolled up easily with fillings for school lunch, and make good quesadillas. Do let me know after you have tried out the GF chapatis. Thanks again. I tried the chapati finally, Mangalakaku! I didn’t use either oat flour or cornstarch – I had such a bad reaction to oats that I refuse to touch them, and I didn’t have organic any corn starch. So I used tapioca and arrowroot flours. The dough was quite sticky. The shrink wrap really helped. 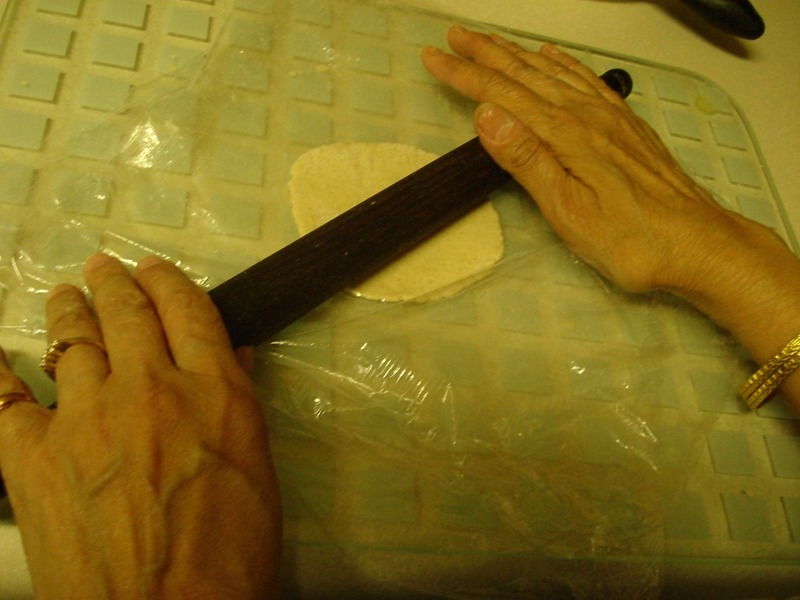 However, I was not able to roll the chapatis out very thin. Any suggestions? We also used the same flour to make gingerbread-pear cake and it was delicious! Just omit the oats and use tapioca instead. You could omit the arrowroot also–probably the combination of arrowroot and tapioca makes it too sticky. 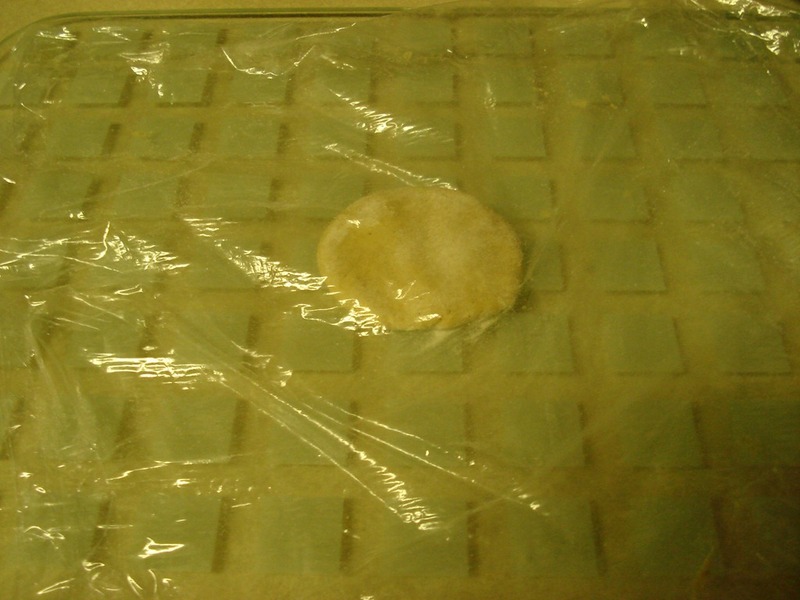 Another alternative is to omit the guar gum, in case you feel the flour has enough stickiness by itself. Do share your gingerbread-pear cake recipe. With your permission I will put it up under your name. Sorry for the delay in replying to you. For some reason, I got no ‘comment alert’. Thanks, MangalaKaku. I am in the middle of moving and my recipes are all packed up. When send you the recipe for the cake in a while. I recently made savoury pancakes (dosa/ghavan) with one part moong dal flour, one park whole buckwheat flour and one part brown rice flour. For flavour, I added crushed green chillies, grated ginger, chopped cilantro, whole jeera and some salt. They were really yummy. Next time, I want to try soaking and grinding whole moong and fermenting it like dosa batter. Take your time, and send the recipe at your convenience. The ghavan sounds great. You can try many different combinations. Moong and any other dals that suit you can be added to rice, soaked and fermented, then ground to make delicious dosas. I also use boiled rice ( about 1/2 cup to one cup plain rice). This adds some nutrition, gives a crispy texture and creates browner dosas / ghavans. One has to keep experimenting all the time. Thanks for this! Stuffed myself senseless with these!! How nice to know this. 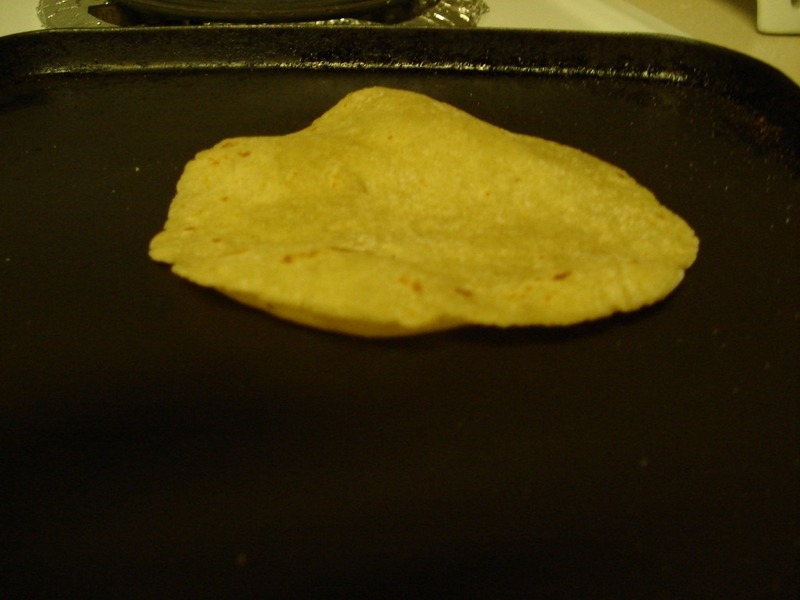 Use these chapati / tortillas to make enchilladas from any regular enchillada recipe. They are delicious. All the best. Many thanks, you’ve brightened up my life! I’ve only known I was coeliac since a car crash less than a year ago in which I broke my back. Since then many things have been difficult but by far the hardest has been not being able to eat my favourite flat breads. I ate 6 of these with some curried chicken and felt utterly stuffed in a way that rice can’t fulfil. I’ll be enjoying these for many years. Cheers. OMG, I’m super happy with this recipe. It’s amazing. I can stop eating rice cakes with my subji’s and dhal’s. Thank you so much. Hi, I have recently started a gluten-free diet and tried this recipe. Works out well, thank you! I also tried adding methi leaves in addition to potato and got lovely parathas, pretty close to the ones made from atta. I have one question: I used rajgira flour (Swad brand) from an Indian store and it says ‘buckwheat’ on it, but I was under the impression that rajgira is ‘amaranth’. Could you clarify this? Rajgira is amaranth–Indian store labels are sometimes inaccurate. Buckwheat is also a gluten free grain and therefore safe, but rajgira works better for my flour mix. I am so glad your chapatis were good. Yes, you can make many interesting foods with this basic recipe. All the best. I am sure my recipe will work well for you. It took me several months of trial and error before I zeroed in on my flour mix The key here is to achive both taste and nutrition. The flours I use are very high in nutrients, more so than any available in the market. But do go ahead and make chapatis with the flour you have mentioned, if that is more convenient. The proportion of ingredients written out is according to quantity, the first being the highest in quantity, then down from there. The most nutritious component, buckwheat is last on the list, therefore least in quantity. In any case, if you can make up for nutrients in other ways, please try my recipe with the market flour, and let me know how it works. All the best! I´ve been trying to do these but i have trouble kneading the dough,i´m using the flour mix you showed in STC,which is sorghum,amaranth and corn starch. When i pour half the water,the dough doesn´t hold it at all,it just goes from a Flour to a Sand consistency. Can you please explain precisely how you knead the dough? as i´m willing to make these chapatis! How are you? Your site is awesome. I thought of trying your gluten free all purpose flour mix but looks like its been taken down. Can you please put it back on your blog. So sorry for the delay. I have checked and rechecked the blog. I see to it that the gluten free flour mix is always on top. I wonder why it did not appear when you tried. Try clicking on this link and it should take you to the right page. I have been checking and rechecking….the gluten free flour mix is very much there. Its called “Grandma’s Gluten Free Flour Mix” Do confirm that you can find it. Sorry for my late reply…I have been travelling and have neglected the blog a bit! Forgive me! I am not sure if you know, but Hing (asafoetida) mentioned in your chef’s tip is not gluten free. It has wheat listed on the ingredient list. People with a gluten allergy need to source GF hing. Yes I do know, and need to modify the recipe. However, most people who have an issue with gluten are not reacting to hing. But its still better to play safe and not include it Some recipes were put up a few years ago and I must review and revise. Thanks for bringing it to my attention. the link to your grandams gluten free flour mix doesn’t work. can you please tell me what the mix is? I am sorry to know that you could not reach the Grandma’s Gluten Free Flour writeup. When you reach the home page of my blog and scroll down, you should find the writeup there. to the write-up. Please try. I made paratha today with this recipe and they turned out absolutely wonderful!! Turned out nice and soft and actually tasted better than traditional wheat in my opinion. It is so heartening to know this, Lin. Thankyou for writing to me.